The APR-1400 (for Advanced Power Reactor 1400 MW electricity) is an advanced pressurized water nuclear reactor designed by the Korea Electric Power Corporation (KEPCO). Originally known as the Korean Next Generation Reactor (KNGR), this Generation III reactor was developed from the earlier OPR-1000 design and also incorporates features from the US Combustion Engineering (C-E) System 80+ design. Currently there is one unit in operation (Shin Kori unit 3) and seven units under construction, four in the United Arab Emirates at Barakah and three in South Korea: one at Shin Kori and two at Shin Hanul. Two more units are planned with construction yet to commence at Shin Kori. APR-1400 design began in 1992 and was awarded certification by the Korean Institute of Nuclear Safety in May 2002. The design certification application was submitted to the Nuclear Regulatory Commission in December 2014 and in March 2015, it was accepted for technical review to determine if the reactor design meets basic US safety requirements. In October 2017, European Utility Requirements (EUR) organization approved changes to the APR-1400 design for emergency cooling, allowing the design to be built in countries outside Europe to EUR certification. The first commercial APR-1400 reactors at Shin Kori were approved in September 2007, with construction starting in October 2008 (Unit 3) and August 2009 (Unit 4). Shin Kori-3 was initially scheduled to commence operation by the end of 2013, but the schedules for both Units 3 & 4 were delayed by approximately one year to replace safety-related control cabling, which had failed some tests. Construction of two more APR-1400 units at Shin Kori, Korea (Units 5 and 6) had been expected to begin in 2014, but as of December 2016 plans had not been finalised. Construction of two new APR-1400s, Shin Hanul Units 1 & 2, began in May 2012 (Unit 1) and June 2013 (Unit 2), with Unit 1 expected to be completed in April 2017. Two more APR-1400s at Shin Hanul were approved in 2014, with construction to start in 2017. After the election of President Moon Jae-in in May 2017, KHNP suspended design work on Shin Hanul-3 and -4, and construction work was suspended on Shin Kori-5 and -6 in July 2017 for a three-month period while a government-appointed committee met to discuss the country's future nuclear power policy. President Moon had signed an agreement in March 2017 calling for the phase-out of nuclear energy while campaigning for president. In October 2017, the committee recommended proceeding with the construction of Shin Kori-5 and -6. President Moon announced he supported the committee's decision, but added that no new construction would be allowed, throwing doubt on the fate of Shin Hanul-3 and -4. 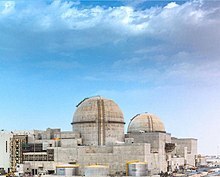 In December 2009, a KEPCO-led consortium was awarded the contract to build four APR-1400 reactors at Barakah, United Arab Emirates. Construction of Barakah Unit 1 started in July 2012, Unit 2 started construction in May 2013, Unit 3 started construction in September 2014 and Unit 4 started construction in September 2015. NuGeneration (NuGen) was formed as the joint venture between Engie, Iberdrola, and Scottish and Southern Energy (SSE) to develop the Moorside Nuclear Power Station in Cumbria; the initial plans called for three Westinghouse AP1000 units. SSE was bought out by Engie and Iberdrola in 2011, and Iberdrola's share, in turn, was purchased by Toshiba in 2013. Following the bankruptcy of Toshiba's subsidiary Westinghouse Electric Corporation in March 2017, Engie pulled out of NuGen in July, leaving Toshiba as the sole owner of NuGen. In December 2017, NuGen announced that Kepco was named the preferred bidder to acquire NuGen from Toshiba. In July 2018 Kepco’s preferred bidder status was terminated, in response to difficulties financing the development. ^ Cold hydrostatic testing completed November 2015. Hot functional testing completed April 2016. ^ Cold hydro testing completed in November 2016; hot functional testing scheduled for May–September 2017. ^ a b Design work suspended pending final national nuclear power plant policy. ^ Cold hydrostatic testing completed 16 Feb 2016. Initial construction completed 5 May 2017, with remaining testing pending operating license permitting fuel loading. ^ Hot functional testing slated to begin in 2018. ^ Major RCS components installed in summer 2017. The APR-1400 is an evolutionary Advanced Light Water Reactor which is based on the previous OPR-1000 design. Under Korean conditions, the reactor produced 1455 MW gross electrical power with a thermal power capacity of 3983 MW (4000 MW nominal). Several other changes were incorporated such as moving to complete digital I/C and implementation of new systems in the Safety Injection System (SIT). The reactor core of the APR-1400 consists of 241 fuel assemblies, 93 control element assemblies, and 61 in-core instrumentation assemblies. Each fuel assembly has 236 fuel rods in a 16 x 16 array (some space is taken up by guide tubes for control elements) containing Uranium dioxide (average enrichment of 2.6 w/o), which is capable of producing an average volumetric power density of 100.9 W/cm^3. Up to 30% of the core can also be loaded with Mixed Oxide fuel with minor modifications. The core is designed for an 18-month operating cycle with a discharge burnup up to 60,000 MWD/MTU, with a thermal margin of 10%. For the control element assemblies, 76 Boron carbide pellets rods are used in the full strength control rods, while 17 Inconel-625 is used in the part strength control rods. Like the OPR-1000 and preceding C-E designs, the APR-1400 has two reactor coolant loops. In each loop, heated primary coolant leaves the reactor pressure vessel (RPV) through one hot leg, passing through one steam generator (SG), returning to the reactor vessel through two cold legs, each equipped with a reactor coolant pump (RCP). In loop 2, there is one pressurizer (PZR) on the hot leg, where a steam bubble is maintained during operation. The loops are arranged symmetrically, so the hot legs are diametrically opposed on the RPV's circumference. Because the SGs are elevated relative to the RPV, natural convection will circulate reactor coolant in the event of RCP malfunction. The PZR is equipped with a pilot-operated relief valve which not only protects against Reactor Coolant System over-pressure, it also allows manual depressurization in the case of a total loss of feedwater. Each SG has 13,102 Inconel 690 tubes; this material improves resistance to stress corrosion cracking compared to the Inconel 600 used in prior designs. Like the late-evolution System 80+ design, the SG design incorporates an integral feedwater economizer, which pre-heats feedwater before it is introduced into the SG. Compared with the OPR-1000 design, the SG features a larger secondary feedwater inventory, extending the dry-out time and affording more time for manual operator intervention, should it be needed. The design tube plugging margin is 10%, meaning the unit can operate at full power with up to 10% of the SG tubes plugged. Each of the two main steam lines from the SG contain five safety valves, a main steam relief valve and one isolation valve. The APR-1400 has been further developed into the APR+ design, which received its official type certification on August 14, 2014 after seven years in development. The reactor design features improved safety and among others "a core damage frequency an entire order of magnitude lower than that calculated for the APR1400 design that it supplants". The APR+ core uses 257 fuel assemblies (16 more than APR-1400) to increase output to 1550 MW gross electricity. Certain safety features, such as backup generators, have been increased from two to four independent, redundant systems. ^ Goldberg, Stephen M.; Rosner, Robert (2011). Nuclear Reactors: Generation to Generation (PDF). Global Nuclear Future. American Academy of Arts and Sciences. p. 7. ISBN 0-87724-090-6. Retrieved 2014-08-26. ^ "Reactor vessel installed at Barakah 2". World Nuclear News. 18 June 2015. ^ a b c d Lee, Sang-Seob; Kim, Sung-Hwan; Suh, Kune-Yull (8 October 2009). "The design features of the Advanced Power Reactor 1400" (PDF). Nuclear Engineering and Technology. 41 (8): 995–1004. Retrieved 4 March 2015. ^ Ciocco, Jeffrey A. (4 March 2015). "Korea Hydro and Nuclear Power Co., Ltd., and Korea Electric Power Corporation – Acceptance of the Application for Standard Design Certification of the APR1400" (PDF) (Letter). Letter to Dr. Ha-Hwang Jung and Dr. Hee-Yong Lee. Retrieved 11 March 2015. ^ "South Korea's AP1400 clear for European export". World Nuclear News. 9 October 2017. Retrieved 5 January 2018. ^ "Shin-Kori 3 and 4 approved". World Nuclear News. 13 September 2007. Retrieved 11 March 2015. ^ "Shin-Kori-3, Korea RO (South)". World Nuclear Association. 2015. Retrieved 11 March 2015. ^ "Shin-Kori-4, Korea RO (South)". World Nuclear Association. 2015. Retrieved 11 March 2015. ^ a b World Nuclear News (2013-10-18). "Recabling delays Shin Kori start ups". World Nuclear News. Retrieved 2014-08-16. ^ "Go-ahead for new reactors at Shin Kori". World Nuclear News. World Nuclear Association. 2014-01-29. Retrieved 2014-08-19. ^ a b c "First Korean APR-1400 enters commercial operation". World Nuclear News. 20 December 2016. Retrieved 23 December 2016. ^ "Celebrations at South Korean groundbreaking". World Nuclear News. 8 May 2012. Retrieved 11 March 2015. ^ a b "Second Shin Hanul unit under construction". World Nuclear News. 26 June 2013. Retrieved 11 March 2015. ^ "Sites agreed for four more South Korean reactors". World Nuclear News. 21 November 2014. Retrieved 11 March 2015. ^ a b c "Design work suspended for new Shin Hanul units". World Nuclear News. 26 May 2017. Retrieved 22 July 2017. ^ "Construction of two Korean reactors put on hold". World Nuclear News. 14 July 2017. ^ "Citizens recommend completion of Korean units". World Nuclear News. 20 October 2017. Retrieved 5 January 2018. ^ "South Korean president accepts public decision". World Nuclear News. 23 October 2017. Retrieved 5 January 2018. ^ "UAE picks Korea as nuclear partner". World Nuclear News. 29 December 2009. Retrieved 11 March 2015. ^ "Construction under way at Barakah". World Nuclear News. 19 July 2012. Retrieved 11 March 2015. ^ "Barakah 2 under way". World Nuclear News. 28 May 2013. Retrieved 11 March 2015. ^ "Construction starts on third Barakah unit". World Nuclear News. 8 May 2012. Retrieved 11 March 2015. ^ "Nuclear Power in the United Arab Emirates". World Nuclear Association. April 2014. Retrieved 2014-08-20. ^ "UAE's fourth power reactor under construction". World Nuclear News. 2 September 2015. Retrieved 2 September 2015. ^ "UK's NuGen cuts staff at planned Moorside". Nuclear Engineering International. 12 September 2018. Retrieved 14 September 2018. ^ a b c "Samsung-led consortium awarded Korean construction contract". World Nuclear News. World Nuclear Association. 4 June 2015. Retrieved 26 July 2015. ^ a b "Fuel loading under way at Shin Kori 3". World Nuclear News. 4 November 2015. Retrieved 16 December 2015. ^ "Korea, Republic of". IAEA Power Reactor Information System. 2015. Retrieved 11 March 2015. ^ "United Arab Emirates". IAEA Power Reactor Information System. 2015. Retrieved 11 March 2015. ^ a b c d e f "Commissioning of second Korean APR1400 postponed". World Nuclear News. 10 August 2017. Retrieved 12 August 2017. ^ a b "Key commissioning test completed at Korean unit". World Nuclear News. 17 November 2016. Retrieved 22 July 2017. ^ "Testing milestone for Barakah 1". World Nuclear News. 16 February 2016. Retrieved 5 January 2018. ^ "Completed Barakah 1 awaits permission to load fuel". World Nuclear News. 5 May 2017. Retrieved 22 July 2017. ^ a b c d "UAE's ENEC submits plan to run first two nuclear reactors". Arabian Business. 28 March 2015. Retrieved 12 February 2016. ^ a b c d e "Major components installed at final Barakah unit". World Nuclear News. 14 August 2017. Retrieved 5 January 2018. ^ "More milestones for Barakah construction project". World Nuclear News. 4 January 2018. Retrieved 5 January 2018. ^ a b "Advanced Nuclear Power Reactors". World Nuclear Association. August 2014. Retrieved 2014-08-29. ^ a b Kim, Han-Gon (28 October 2009). The Design Characteristics of Advanced Power Reactor 1400 (PDF). Korea Hydro & Nuclear Power Co (Report). IAEA. IAEA-CN-164-3S09. Retrieved 13 August 2017. ^ Peachey, Caroline (26 August 2014). "Design approval for Korean APR+ reactor". Nuclear Engineering International. Retrieved 11 March 2015. ^ Davis, Will (2 September 2014). "APR+ Design Certification Announced". atomic power review. Retrieved 11 March 2015. ^ "APR+ Reactor". Korea Electric Power Company (KEPCO). 2011. Retrieved 11 March 2015. Kim, Han-Gon (28 October 2009). The Design Characteristics of Advanced Power Reactor 1400 (PDF). Korea Hydro & Nuclear Power Co (Report). IAEA. Retrieved 13 August 2017. "Advanced Nuclear Power Reactors". World Nuclear Association. December 2014. Retrieved 4 March 2015. "Status report 83 - Advanced Power Reactor 1400 MWe (APR1400)" (PDF). International Atomic Energy Association. 11 April 2011. Retrieved 4 March 2015. "APR + (Advanced Power Reactor Plus)" (PDF). International Atomic Energy Association. 6 November 2013. Retrieved 4 March 2015. Euan Mearns, Andy Dawson (18 December 2017). "An Overview of the KEPCO APR1400". Energy Matters. Retrieved 18 December 2017.